A group of creditors is opposing Eurotunnel's plan to restructure its huge debt, seen as critical for the firm to be able to stay in business. Eurotunnel announced a preliminary deal with the bulk of its creditors last week which would see its debt cut by more than 50% to £2.9bn (4.2bn euros). But creditors holding about a third of the debt said they would vote against the deal at a key meeting next month. The group described the debt-for-equity deal as "not satisfactory". The Channel Tunnel operator needs the backing of shareholders if it is to restructure its £6.3bn debt, a key step towards stabilising its finances. 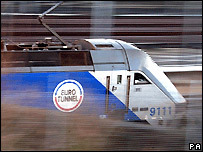 If it does not get the necessary support, Eurotunnel has warned that it could be forced into insolvency next year. The rebel creditor group has voiced its opposition to the debt restructuring proposals and threatened to vote against them at an extraordinary general meeting on 12 July. Under the terms of the outline deal, creditors would see their bonds converted into new shares in the company, significantly reducing the holdings of existing investors. "I do not see where there is interest of the shareholders or that of the creditors (in the deal)," Jean-Pierre Mattei, head of an association of junior creditors, told Le Parisien newspaper. Eurotunnel said it had had no official contact with the group in question. "Neither has it received any alternative restructuring plans from any other financial institution," it said in a statement. "The group stresses that any alternative solution should, in terms of debt write-off, have at least the same ambition."